Prepare to face Revan, one of the galaxy’s most revered characters, in the latest story-driven adventure from Star Wars™: The Old Republic™. BioWare™, a division of Electronic Arts Inc. (NASDAQ: EA), and LucasArts have announced a brand-new digital expansion, Shadow of Revan, coming December 9, 2014. Shadow of Revan offers five new levels of story-driven missions, an increased level cap of 60, new worlds to explore, high-level multiplayer Flashpoints and Operations to join with friends in dynamic challenges and much more. Plus, for a limited-time, all Subscribers who pre-order receive a Class Experience Boost, offering players 12x experience gain through Level 55 with the opportunity to immerse themselves exclusively in exciting class story missions, but only through December 1, 2014. In Shadow of Revan, a long-hidden sect of extremists has emerged from the ongoing war between the Sith Empire and the Galactic Republic. This group is led by Revan, the former hero of the Jedi Civil War. These fanatical “Revanites” are gathering an army with an apocalyptic plan that will leave the Republic and the Empire in ashes. Players will prepare to face Revan and adventure alongside a host of intriguing characters, including Theron Shan, Lana Beniko, and Jakarro the Wookiee. 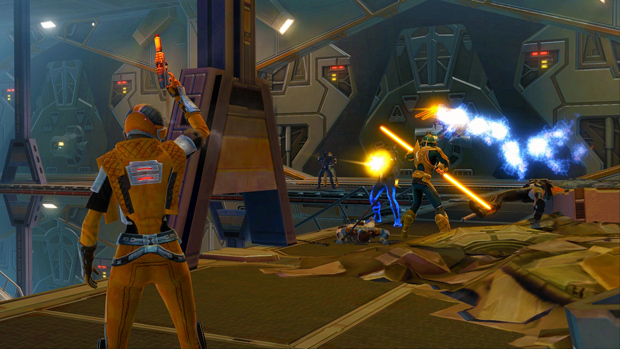 Beginning today, players can pre-order Shadow of Revan for $19.99 online at http://www.swtor.com/buy.